Home Hollywood Singer Taylor Swift won the award in the Brit Awards, this is a secret! 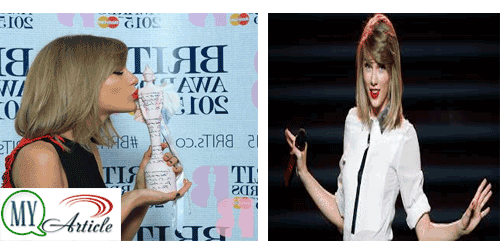 Taylor Swift won the award in the Brit Awards, this is a secret! Who does not love a beautiful singer on this one? Almost everyone in the whole world talking about his name. The songs were a lot of plays here and there. Yes, Taylor Swift! At the Brit Awards held on February 25 last, this beautiful singer was nominated for International Female Solo Artist category. And you know what? Shake It Off song has brought him victory in the category. That night he beat several competitors such as St. Vincent, Sia, Lana Del Rey, and even Beyonce! It was the first victory Swift in 2015. The Brit Awards event was held at the O2 Arena, London. Swift also dedicates victory to some English friends. "I love you, Ed Sheeran, wherever you are. I also want to thank the way and Ellie, and also Sam. I'm very lucky to have you in my life," he said in the speech. This is a very special year for Swift. Titled album in 1989 reap tremendous success. Released in 2014 and continues to dominate the charts in Britain and America until now. 1989 album was another success as it involves a well-known songwriter named Max Martin. This album has changed a Nashville singer Taylor Swift from the country became a big pop star to be reckoned with.